I am a huge fan of Disney and often dream that one day I might be CEO and take control of the Magic Kingdom. Until I achieve that dream, this addicting game will have to do. Disney Magic Kingdoms will let you control your own version of the Magic Kingdom. 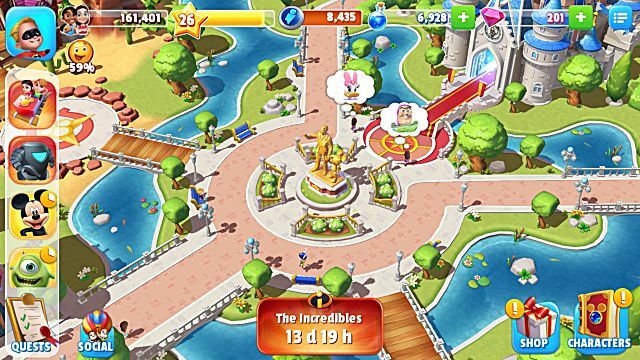 From Main Street to Cinderella's castle, the park is yours to create, and you can use some of your favorite Disney pals to help. The story behind Disney Magic Kingdoms is that evil Maleficent has put a curse on the kingdom, and you have to regain control by clearing the curse with assistance from the wizard Merlin. 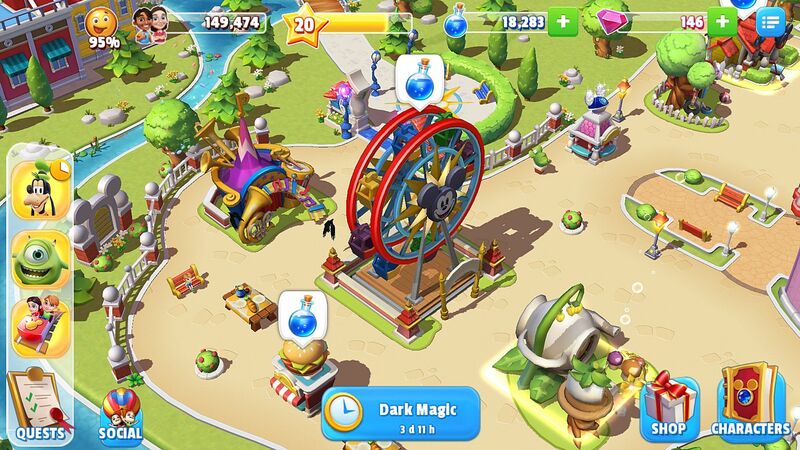 Merlin will occasionally pop up when it is time to expand your park. For this guide, I will be your Merlin and will help you put the magic back in your Magic Kingdom. To start off, you get Mickey Mouse. Yes, the Mickey Mouse. You will do a simple quest, and then you will unlock Goofy. 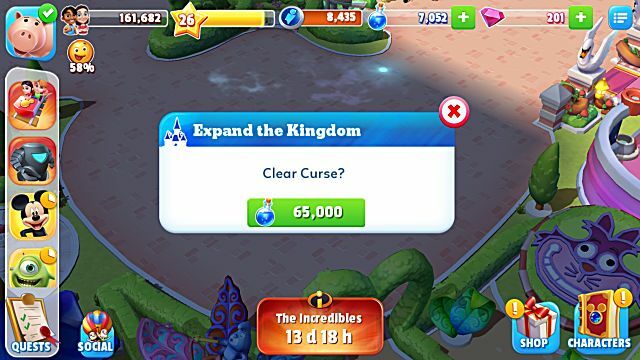 You will use Mickey and Goofy to run quests around the park to build up magic that will unlock the first section of the park. Once you do that, you are in control. The game easily explains each goal you have to reach in order to proceed to the next story quest. By doing quests with each character, you can earn magic along with items that will help you unlock other characters. 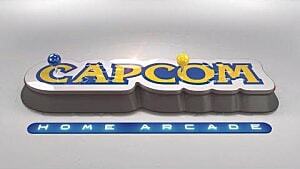 Each character can be upgraded to Level 10. While you are expanding your park to your liking, here are some things that you should do and should not do. If you know you will be checking the app occasionally throughout the day, put the characters on quests that will last until the next time you check in. 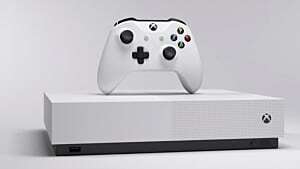 If you are in class and know you will be able to play in 3 hours, send your character on a 3 hour long quest. It will earn you a lot of magic and you can send the character out to do more things. Most of the time, you can earn more magic doing two 3 hour quests compared to one 6 hour long quest. 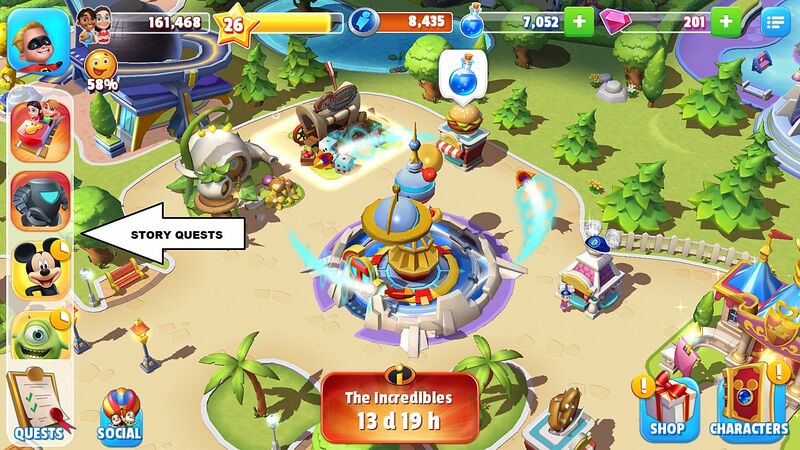 If you see that guests in your park have a character icon next to them, or a roller coaster icon next to them, that means they want to see a character or go on a ride. It is always good to grant the guests their wishes, because it will create happiness and will help you unlock parades -- which give out good rewards when they're finished. So make sure you grant those wishes when you have the chance. Level up your characters when you have the opportunity. 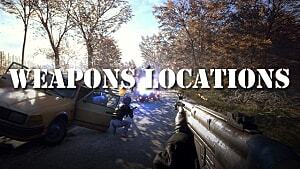 Each character has their own story that you can complete. You have to level up the characters in order to keep playing their story quests. For example, Mickey Mouse has to be a level 9 to receive the quest to find out where Minnie is. 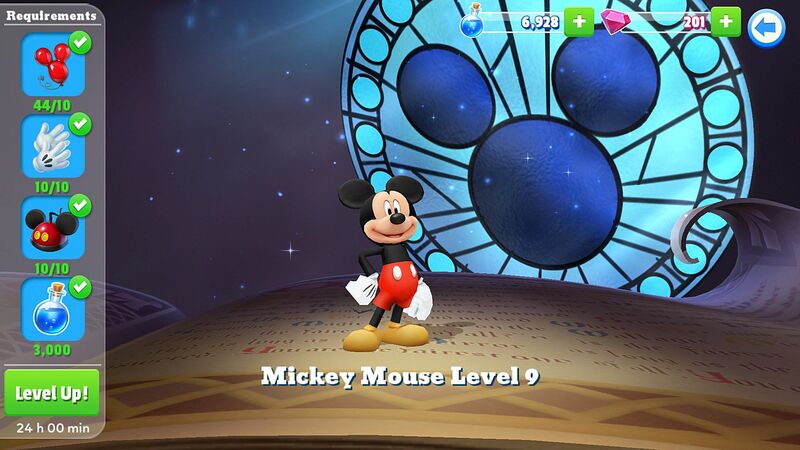 If you want to unlock Minnie, you have to level up Mickey so he can complete that quest. You collect purple diamonds each time your progression bar levels up. 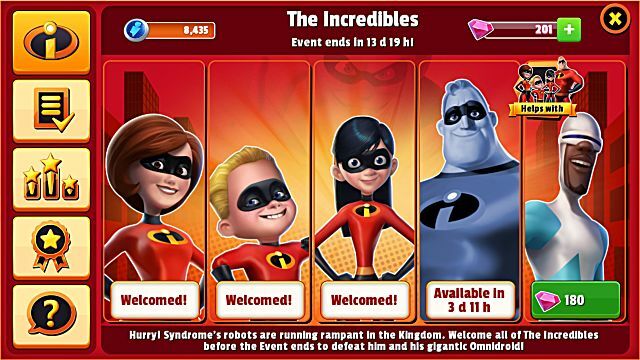 You can also receive diamonds when you complete a group of characters. Those diamonds could be used to hurry up one of the character's quests or unlock non-story characters. 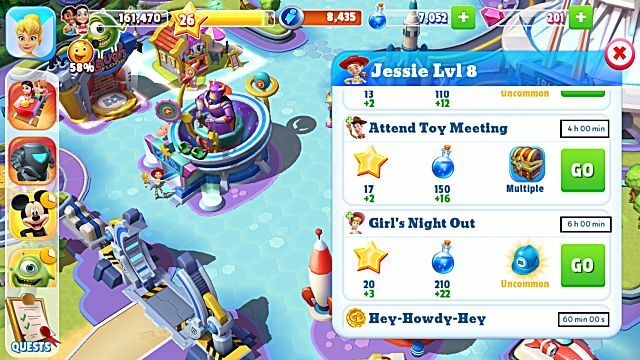 For example, if you have enough purple diamonds, you can unlock Pluto, Rex, Boo, Wall-E and more as your story progresses. These characters will not advance your story or effect your story in any way. 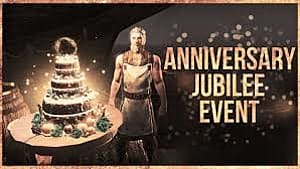 Every once in a while, the game will have a big special event. It could be tapping on birds that are flying around the kingdom, getting rid of the magic brooms, or so on. If you check the app often and try your best to take part in these special events, you will get bonus magic at the end of the event based on where you are on the leaderboards. So try and take part whenever you can. Throughout the story, Merlin will arrive and tell you that you can expand your kingdom. That means that your story is progressing and you are doing a great job. When that opportunity comes, you need to make sure you have enough magic to do so. There are sections of the park that you can unlock without needing Merlin to tell you. Those sections will not progress your story, and will only give you more space to put rides -- so you don't need to worry about that. 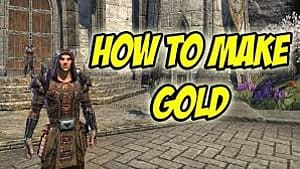 Don't make the same mistake I did and spend 50,000 magic to unlock a small square in the park when I should have used it to unlock a character that progresses my story. 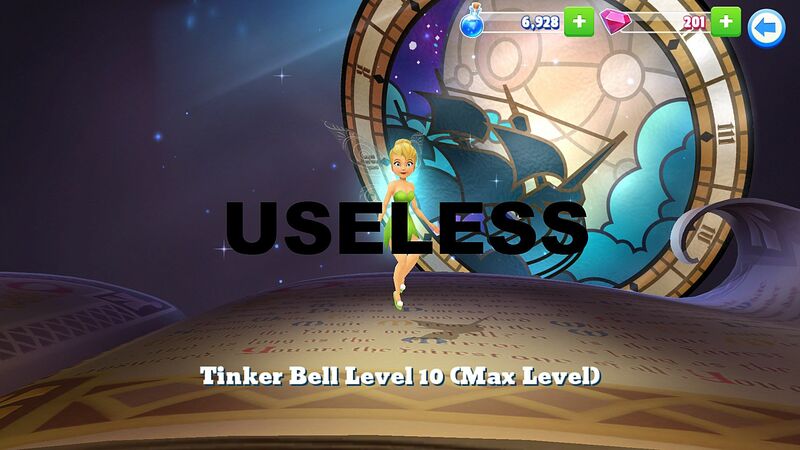 As of right now, I have Tinkerbell at level 10 and her story doesn't affect the main plot at all. You don't have to upgrade her if you don't want to. If all your characters are busy, and you have the extra magic, and you feel like being nice, then you can upgrade her. Or you can do what I did -- get annoyed that she isn't doing anything to progress the story, then quickly upgrade her to level 10 so you can focus on the other characters. 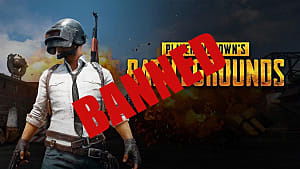 This is a free game to buy. 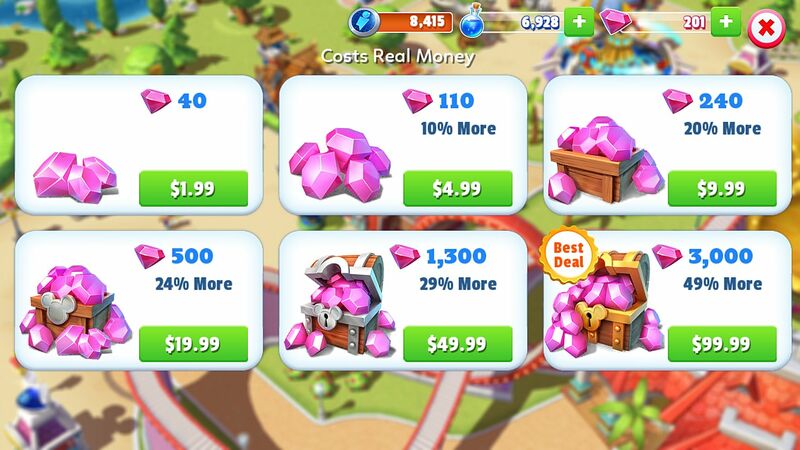 There are microtransactions available that will allow you to purchase purple diamonds. But if you manage things right, you don't need to buy more purple diamonds to advance the story. I haven't put a dollar in this game, and my park is expanding just fine. 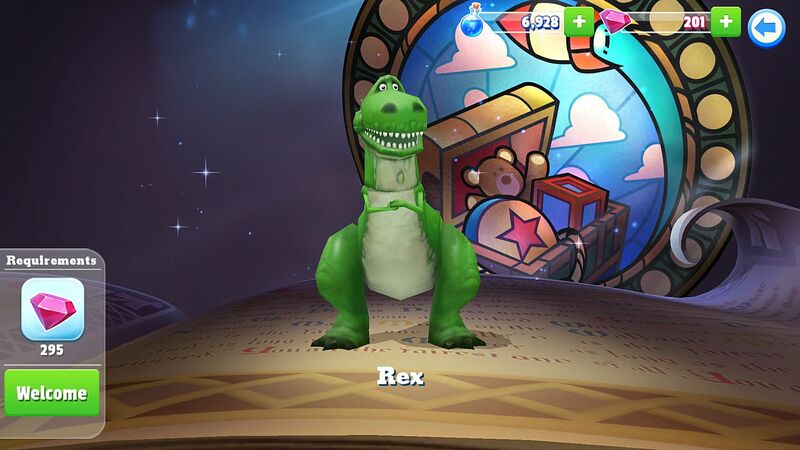 But if you really want those extra purple diamonds to purchase Rex or Boo, you are more than able to. 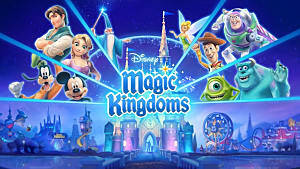 Disney Magic Kingdoms is one of the few apps that I open any chance I get. I am hooked on this game and I am not ashamed to say that. 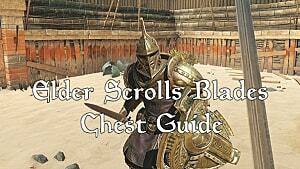 My park would have more characters and probably be farther into the story if I had this guide in the beginning. 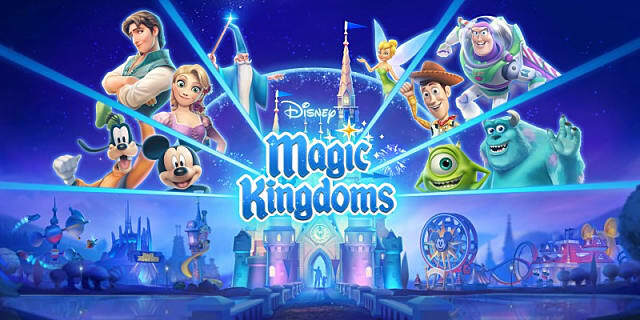 I hope this guide helps you in achieving your dream of running the Magic Kingdom, or at least your own version of it inside the game.